You know how I am always telling you can get my books on Kindle , including for free if you have Kindle Unlimited? I always thought that I would not like ebooks because I love the look and feel of “real” books. But I discovered I also love free and low-cost books just as much and the convenience of carrying hundreds of them in my purse. My only problem is that now I am addicted to Kindle Unlimited and Bookbub, the best sources to find out about free books that you can either own or borrow for an unlimited time. 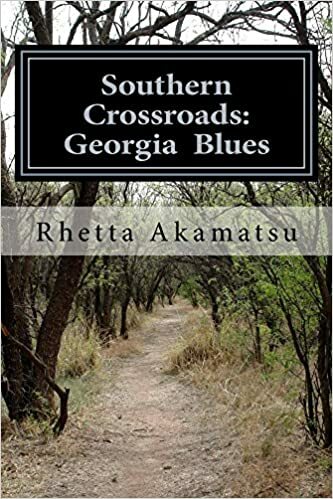 My new book, Southern Crossroads: Georgia Blues, is about the rich history of Georgia blues and also the vibrant scene that we have in this state today. It starts with a history of the area around Sweet Auburn in the 20;s and 30’s and ens with the newest young musicians playing today. There are profiles of over 3 artists and many pictures. You can see for yourself by clicking on the title above! 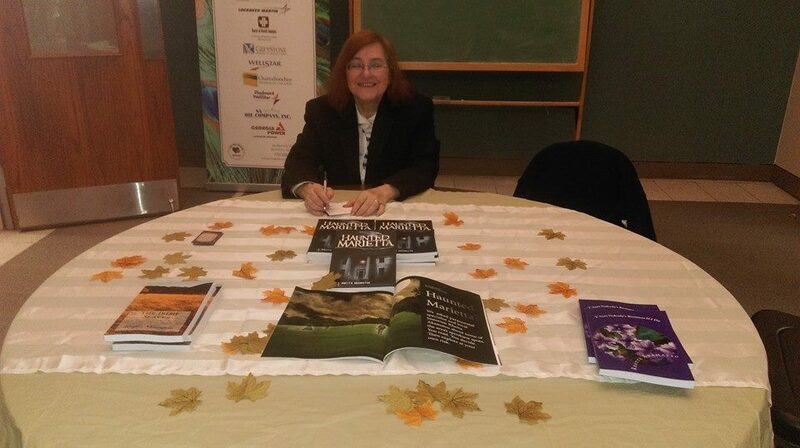 Here’s a photo from my appearance at the Switzer Library today talking about self-publishing with other authors and the interested public. It was a great day! Please also let me know if you see ways I could improve the campaign. Constructive criticism is VERY welcome! Have to send out manuscripts and hope they get read and approved. Odds are not great. Most manuscripts end up in a “slush” pile. Make sure you address your mansuscript to someone specific and follow all the rules as outlined on the company’s website or you will never get read. Some initial support especially in the first 6 months. Then support depends on sales. If your book does not sell well it will be warehoused in less than a year. Royalties once or twice a year if sales meet the minimum. Give up rights. Some initial support. Smaller royalties. My experience is that my book has sold over 2000 copies and I have received $400 in royalties total. Expensive to buy your own books. Can’t set on price. Don’t have control over rights. May be restrictions on how you can publicize. Print on demand is the way I recommend. No upfront expense. You can buy your own books for a small price and set the price you want to sell it at. Immediately earn royalties at the rate you set, paid monthly. CreateSpace has great distribution, even in Europe and elsewhere. Have to publicize your book yourself and arrange your own bookings. If you publish your own books it is VERY important to make sure you format it correctly so that it looks professional. This is a pain but it MUST be done. Also, be very careful about editing. If at all possible, hire someone to do this or at least get someone else to go over your manuscript. It is VERY hard to catch your own mistakes because your brain sees what you think you wrote, not what you actually wrote. Make sure if you use pictures, they are good quality and large enough to see well. Color will cost you more and you will have to make your book more expensive. Make sure your headers and page numbers are consistent. You have to be willing to take the risk of bothering some of your online friends and post about your book on Facebook and Twitter! Have a Facebook page just for your book. Don’t post about it multiple times a day but do post about it at least 3 or 4 times a week. Tweet about it once or twice a day. You can also set up automatic tweets with several programs online or through BookBuzzr, which also lets you put up samples of your books for people to read, with up to 30 pages. Have a website. You can easily make one on WordPress, but pay the small fee to get your own URL. Mine is rhettabooks.com. Or you can pay for domain hosting and buy a domain name at GoDaddy or elsewhere and set up your website that way. Always accept speaking engagements when they are offered if you can at all. Offer to talk to book clubs.. Send out press releases. There are many tutorials online to teach you how to write an effective one. Google “press releases” and you will find many free places on the Internet to post your press releases. I am cheap so I always use the free ones and that has worked well for me. Use sites like GoodReads to get reviews and list your books. Ask for reviews at Blogcritics.org and ask anyone who tells you they like your book to give you a review on Amazon. Make sure you have an author page on Amazon! Writing a book is the easy part. Writing a book worth reading is harder. Publishing is easy. Getting a book ready to publish is hard. If you can afford to, it is worth hiring someone to edit your book for you and to make sure it is formatted correctly, and to hire someone to make your cover. If you can’t hire someone to make your cover, you can use the templates at CreateSpace or other on-demand publishers to create a cover, but make sure that you customize it in some way, by uploading your own photo or creative use of fonts in the title or something to set it aside from other books. The important thing is to remember: If you want to have a published book, you can. Just make sure you do your best so that book represents you the way you want it to, and then let the world know about it every way you can. They can’t read it if they don’t know about it! My mother-in-law has a picture of my husband’s great grandfather or great-great grandfather dressed just lke this.